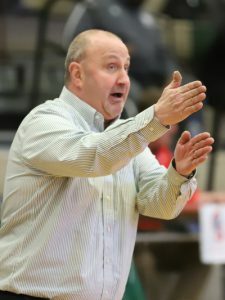 SOUTH HOLLAND, IL – Coach John Pigatti just completed his 12th year as head coach of the SSC Bulldogs and has accumulated a tremendous career coaching record of 353-71. He has won nine Region IV Championships, his teams have been to nine NJCAA Division II National Championships in 12 years and have also been ranked #1 in the country. The Bulldogs have also been ranked in the top ten every season since Pigatti has been at South Suburban College. Coach Pigatti has been named the 2017, 2016, 2014, 2013, 2012, 2009, 2008, and 2007 Coach-of-the Year in Region IV, District 4, and by the Illinois Basketball Coaches Association. More importantly, the sophomores he recruited have signed a scholarship to play at a 4-year college or university. Congratulations to Coach Pigatti and the 2018 Bulldogs who qualified for the National Championship Tournament. Jordan Matthews was named NJCAA, Region IV 1st Team and MVP of Regional Tournament and Courtney Carter 2nd Team All Region. Jamal Bailey and Lawrence Lemon were Region IV All-Tournament Team. It’s been an outstanding, exciting, successful season! For more information, contact Coach Pigatti at (708) 596-2000, ext. 2524. SSC is located at 15800 South State Street, South Holland, IL. For more information about all of SSC’s programs, admissions and registration, please visit www.ssc.edu or contact the Admissions Office at (708) 210-5718.